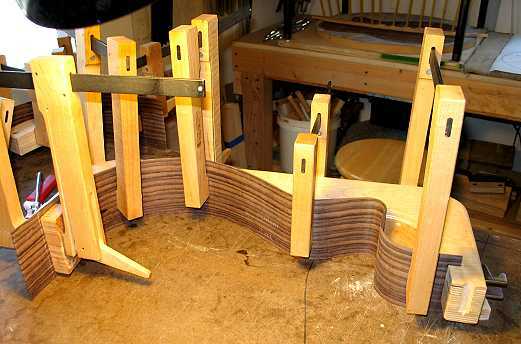 The Neck Block, Center Strip, and the Cutaway!!! Well, the first thing I did today, of course, was to remove my cutaway side from the bender to see how it came out. There was quite a bit of springback, for some reason, in the upper part of the cutaway. So, I decided to cook it again in my little bender, this time without the spring steel on the bottom; this brought the side a tad closer to the form. At first I was going to leave it in there, again, until tomorrow, but my curiosity and the suspense got the better of me, and I removed it from the bender at around 3:30 p.m., about 6 or 7 hours later. It was quite a bit better, but there was a little bit of springback in the lower bout and waist, so I touched it up by hand on the electric bending iron. The cutaway horn does not fit the form perfectly, but I'm happy with it as it is; it's a smooth bend and it looks good. Take a look! 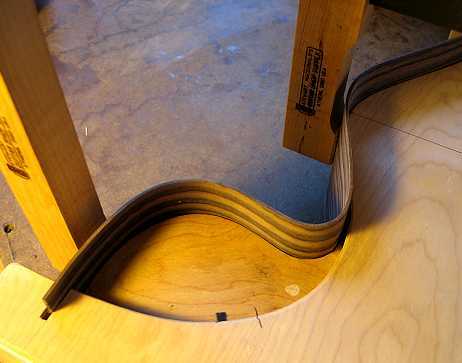 Tomorrow I'll work on making the spreader blocks for this cutaway side, so I can put the two halves of the mold back together and trim the ends of the sides, in preparation for installing the neck and tail blocks. I am SO relieved that this all came out okay!!!! I also finished up my neck and tail blocks. My neck block is 2-3/4" wide, 1-3/8" deep, and 3-13/32" tall (to stick up a tiny bit above the edge of the sides). My tail block is 2-7/8" wide, 7/8" deep, and 4-1/8" tall. 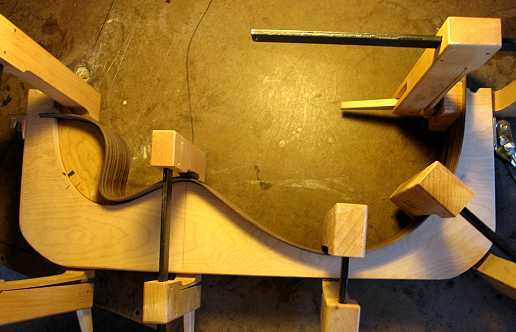 Here's my neck block, after I have cut out a slot for access to the Allied Lutherie truss rod I will use, and after I have drilled the holes for the two bolts I will use for my neck attachment. 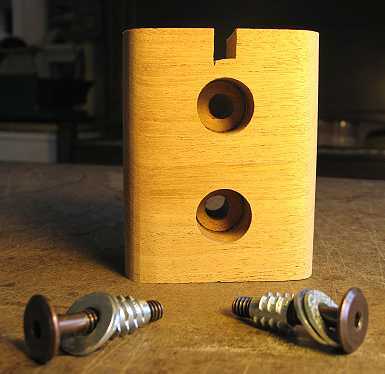 My two bolt holes will be 1" down from the top of the block, and another 1-1/2" below that. For each hole, I first drill halfway through the block with a 3/4" Forstner bit, then drill a 3/8" hole through to the other side. 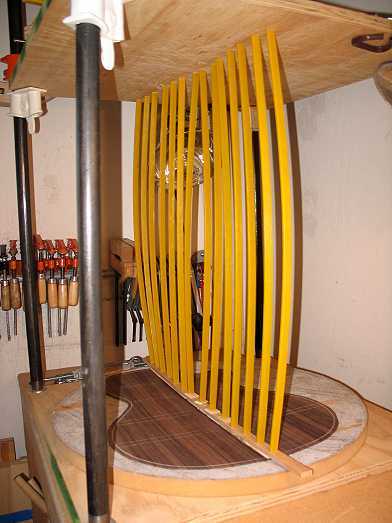 I will be using 1/4-20 furniture bolts and the 3/8" hole gives some room for adjustment in fitting the neck. 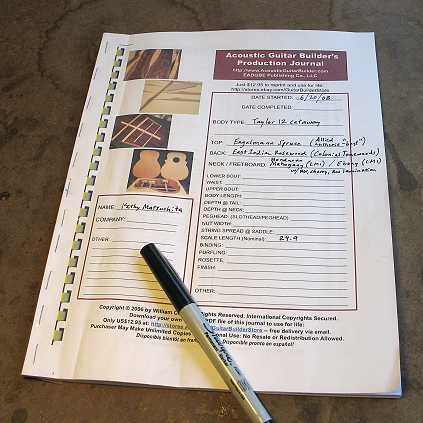 Finally, here's something new I've been using as I'm building this guitar — a cool "Acoustic Guitar Builder's Production Journal," which I got from Bill Cory's wonderful "Kit Guitar Builder" site . Up to this point, in all my building, I never have really kept consistent records of what I did (apart from the accounts on this website). I haven't been very good at keeping records of measurements, etc., of the instruments I've made, so I often forget the exact details when it comes time to build something similar again. Well, this journal comes as a 31-page PDF file that you can reprint as many times as you like. 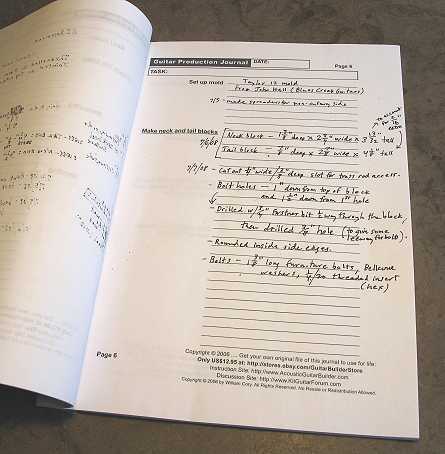 It has different pages for different parts of the process, with space for you to keep notes on details you want to remember. I decided to use it for this project, and it's sure to come in handy later! No more getting confused and reinventing the wheel!